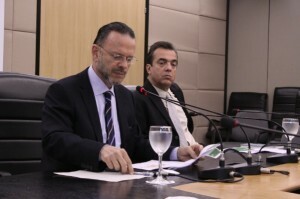 In figures released recently, Brazil’s Social and Economic Development Bank (BNDES) plans to invest 1.858 trillion Reais (approximately $906 billion) between 2013 and 2016. The figures were released by the president of the bank, Luciano Coutinho: “We are witnessing an unquestionable improvement in investment plans, based on the data we have,” Coutinho said. Among sectors financed by BNDES, the manufacturing sector received the highest investment in 2012, totaling 847 billion Reais, and will see be recipient to most loans in the next three years. Infrastructure absorbed 359 billion Reais in 2012, with a further 498 billion Reais expected to be invested between now and 2016. BNDES supplied the service sector with 159 billion Reais last year and future investments are expected in the order of 219 billion Reais. The remaining sectors together received 1.858 billion Reais and should receive a little over another billion in the next three years. The volume of funds released to micro, small and medium enterprises was the largest in the bank’s history, totaling 50.1 billion Reais. In 2012, total investments amounted to approximately 156 billion Reais, up 12 per cent compared to 2011, and a total of 2.394 trillion Reais was invested between 2008 and 2012. Coutinho said that efforts to beef up Brazil’s infrastructure ahead of the 2014 World Cup and 2016 Olympic Games are driving the increase demand for BNDES lending and anticipated that Brazil has further plans to auction new concessions to operate airports, highways, ports and railways that will require heavy investments by winning bidders, and could pave the way for private sector involvement. “One of the strongest factors in the acceleration of investments in the introduction of new concessions”, said Coutinho. “Concessions represent an opportunity to share the financing of these investments with capital markets”. He added that infrastructure bonds and other financing debentures will be tested in 2013 to see whether they are viable means for such projects.